The problem is that these implicit biases we harbor impact the way we view the world, and is the basis for the gender inequality we are seeing not only in medicine, but in almost every industry. When I started medical school I had no idea that I could potentially suffer any setbacks due to my gender. The home I was raised in told me that I could do anything or be anything. Gender discrimination was not in my vocabulary, and I was blind to its presence. However, I was also being molded by societal bias. My grandmother was a nurse (not a doctor), and when I was eight, and was asked what I wanted to be, I said a nurse. My mom later told me, ‘well, you can be a doctor, you know.’ I actually didn’t know. But that little encouragement was exactly what I needed to open my mind to the larger possibilities for my future, and actually alter the bias I had already developed in my young age. During medical school, I was developing my own implicit gender bias. One I am now aware of is when I am about to talk to an orthopedic surgeon on the phone, I immediately assume I am going to talk to a man. In medical school I learned that there are areas of medicine that tended to have gender predilections, like more men go into orthopedic surgery, more women go into pediatrics. At the time, I didn’t question or think about these gender issues much. I also didn’t consider there was a possibility that my gender could play a role in my career decisions or options. 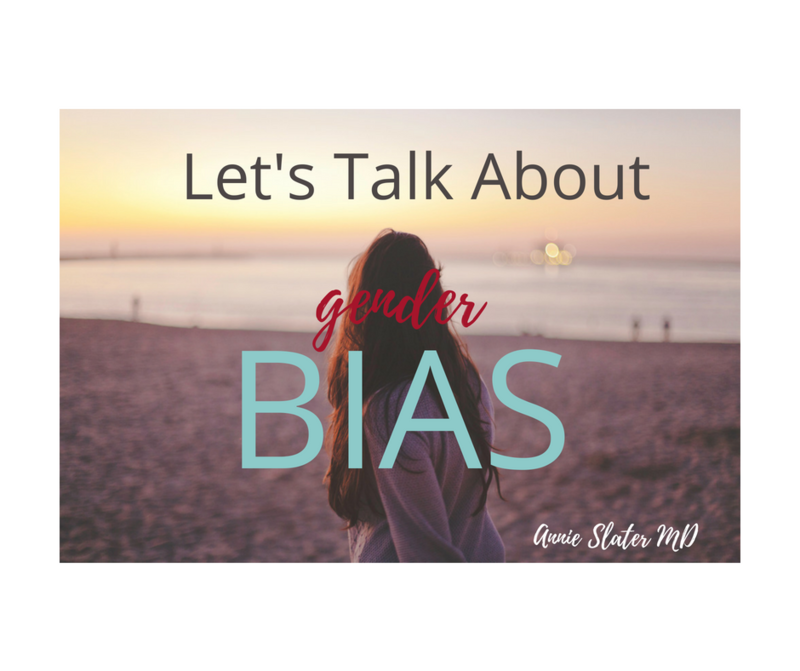 In my pediatrics residency I felt equal to my male colleagues (which is probably a very different experience than a female orthopedics resident), and I am sure I developed many biases that I am not aware of. But, I do recognize I developed a bias around women having children during training. There was little to no compassion or empathy around child-rearing. Women had children, and had issues with childcare. The general consensus was, ‘that is your choice, deal with it, and make as few waves as possible for the program and your colleagues.’ Oh and, ‘we aren’t here to help you figure it out.’ I unfortunately modeled the behavior exhibited by leadership and did not develop much empathy for the women who ended up having children during residency. I am completely ashamed of this now, but am more disappointed that the behavior has been allowed to proliferate. Early on in my job as an attending, I was still pretty unaware of unconscious bias or the gender gaps that exist, and I did not recognize that my gender could hinder my future job trajectory or my opportunities. But, I was starting to wake up. The instances I noticed started small, but the more aware I became, the bigger the issues seemed. The little things I experienced were parents complaining that they never saw a doctor, when I knew I introduced myself as the supervising physician. I would be working with a male resident, student or fellow and there would often be an immediate assumption that he was the one with decision-making power. It was embarrassing to correct and unsettling to experience. I heard rumors that some of my female colleagues were told they needed to delay their promotion when they had a baby. I am sure that the intent behind this thought was to benefit the woman, ie giving her more time to prepare. But it feeds the bias that women are less capable when we have children. There were reports on the gender wage gap, in my field and across the country. It was no longer a theory. Unfortunately, the most recent reports show it is not only real, it is getting worse. I initially was in disbelief. I said in my head, ‘There is no way I am getting paid less than my male counterparts.’ But, how did I know? I didn’t. One of my friends described an incident where she asked for more responsibility outside of her clinical time, and what was offered was so egregiously time intensive she felt essentially blown off. She said ‘no one should work that much, but I have small children at home, so they knew I wouldn’t be able to do it.’ I wondered if her gender had anything to do with the way she was treated. I started recognizing that there weren’t a lot of women at the top to discuss these issues with. This is an example of the ‘leaky pipeline’ phenomenon—in Pediatrics, in particular, it has been reported that 70% of the residents are female, which becomes approximately 50% of academic faculty. But only 30% of Division Chiefs, Vice Chairs, and only 25% of Chairs are women. Unfortunately, we don’t have a ton of answers. There are some new studies being published that are looking at this. I think we will see problems we didn’t know existed, and become more aware of the gaps that do exist. I also think the lessons we are learning will prove to be just the tip of the iceberg, and true examples of how our implicit bias has been raging unchecked. I also think we will be able to recognize how we as a culture have been complicit in its proliferation, as I have stated earlier with my own biases. In March of 2017, JAMA published an article describing evaluations for Emergency Medicine residents. In the study, it was found that female residents reached the same milestones as men in the first year of training, however after that year, the men achieved milestones at a rate that was 12.5% higher than the women. There were 30,000 evaluations they looked at, and it was clear the issue was gender. This is where the gender gap started for these particular residents in this training program, likely buoyed by implicit bias. Is it possible that regardless of gender, we are ALL rating our female trainees with a harsher scale? The evaluations were controlled for gender of the evaluator, so women are doing this too. These findings blew me away at first, and I found them to be incredibly discouraging. But also familiar. How many of you women have felt like you are climbing Mt. Everest while your male colleagues sail past you? How many of you have judged your female colleagues more harshly than your male colleagues? Dr. Julie Silver, a physician in the department of Physical Medicine and Rehabilitation at Harvard, is at the forefront of studying bias and how it affects us, and she has two very interesting studies that came out recently. One of these reports discusses the disparities in the number of awards given to women by the American Academy of Neurology. Despite an increase in female representation in the field, where they are comprised of upwards of 30% of all neurologists, the number of awards given to women has stayed stagnant at about 18%. That is less than one in four. Dr. Silver also recently studied the number of women being represented as first authors in pediatric journals. Although women make up 62% of all pediatricians, and around 50% of full-time faculty, women are only first authors 42% of the time when looking at a cross-section of the 4 highest –impact general pediatric journals. The problem with implicit bias is that it hides under the radar, sneaky and hard to pinpoint. When gender bias is left unchecked, women are made to feel increasingly ‘less worthy,’ as opportunities go to male colleagues, and questions about advancement or leadership roles are dismissed. I think we start by admitting bias exists, and then be willing to commit ourselves to changing the way we think. Can you think of biases you have? Can you think of a time you judged a female colleague in a way that was possibly unfounded? For all the women out there…. We have to learn to promote one another, and to be able to use each other on the ladder to the top. We have to celebrate each other’s victories and stop operating from the place that we should be competing against one another. We are a part of the problem. We also need to stop acting like we don’t deserve a spot at the table, and start calling out gender bias when we see it. If we don’t, we are being complicit. Thank you Annie. This post couldn’t have come at a better time. This is exactly what I’m experiencing in all areas of my life at the moment. Thanks Chelsea for reading, and I am glad it could help you. I am feeling like we really aren’t discussing this topic enough, and the more we do, the more we realize how much has got to change for women to be able to ascend to positions of leadership. Annie, such a great series of words. I’m glad the industry has you, voicing what many experience. I’ve seen this from the other side, and it’s real, and it’s hurtful to the industry. I’ve walked into a treatment room as a friend, with the primary family member being a woman, I’ve been spoken to like I’m the decision maker. Goodness. How many functional issues in the ER, the OR, the treatment room, could be solved and improved if there was a major positive shift toward gender equity? Thank you Joshua for highlighting the fact that this problem is so incredibly pervasive. I hope that my words are able to at least make people think a bit about how their bias may be affecting their everyday interactions. Hello from Hopewriters! Thank you for sharing your story. I love when you wrote: “It was embarrassing to correct and unsettling to experience.” Don’t give up. Small pivots can make big differences and we are paving a way for the next generation as well. Thank you Andrea! I appreciate the support so much!! I agree so much with you, that small changes can start a trend….I think it starts with recognizing how present our biases actually are. The CEO of our hospital is a female doctor, head of urology, head of gynecology are women. At the orthopedic dept. when I was there, we were five senior female consultants. There is a great respect for both women and men here (Denmark). Never the less we have to stay strong, and stand in our power and support each other. Thanks Lilli! I thought of you a lot as I wrote this, not only because of the fact YOU are a female orthopedic surgeon, but also because you have stated that your CEO was a woman. I wish the US was as progressive as Denmark…I should pick your brain about things like maternity leave, how you worked when you had small children…etc. Thanks so much for reading and sharing your experiences! Thank you for this perspective! I agree there are biases and sometimes it’s difficult for me to see this one. Even though I am female, I stay home with my kids by choice. I wonder how much of my own upbringing/societal bias teaching shaped this “choice” for me? Interesting to try to separate it all. And this is also exactly why I feel so comfortable in my current profession! It feels AMAZING to constantly be supported, understood, appreciated and promoted! within my career field. We need more companies like R+F that work to promote moms/wives/women rather than tolerate them. Yes Angela! Thank you for your insight!!! Everything you are saying is so important. It is striking how many biases we all hold, that we don’t always recognize we do. I think it is super important to be supported, promoted by your place of work! Another reason why I am in such support of having women in leadership positions, as I think it changes the dynamic. Thank you for this! I would love to post this on my website blog. I feature a blog written by my pseudonym? Victoria Jones M.D. who is the protagonist in my first work of fiction about a female surgical oncologist raising two children on her own. It touches on many of these themes.